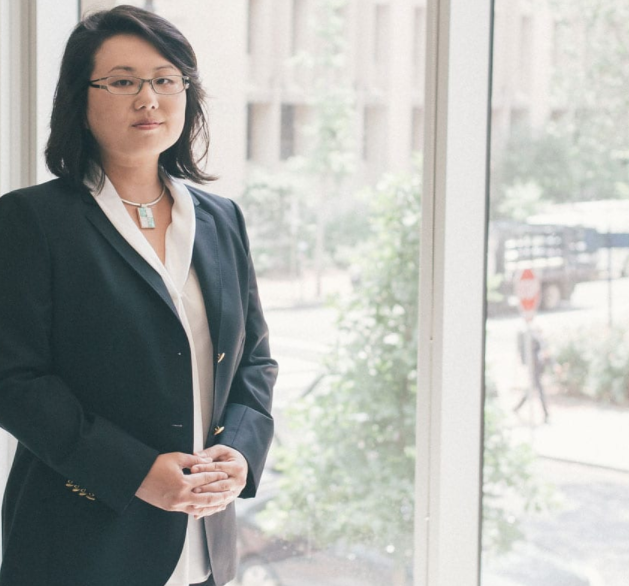 When pro bono attorneys like Julie Oliver-Zhang partner with DV LEAP, they become heroes – for survivors of abuse and for justice. Domestic violence cases are an opportunity for attorneys to use their legal skills on behalf of survivors and their children who seek protection. We are proud to work with Julie and our network of 175+ pro bono lawyers across the U.S.
Julie Oliver-Zhang is a DV LEAP Hero! Earlier this year, Attorney Oliver-Zhang was a guest of the public access TV program, Washington, My Home. In January 2017, she was invited as a special guest to the TV program’s ten-year anniversary celebration. Washington, My Home is an unique TV program intended to keep the Washington, DC metro-area Chinese community informed and connected with news and notable people in the area. “Young and Accomplished”, Attorney Oliver-Zhang, on three separate show segments, discussed domestic abuse and victim’s rights in protecting themselves and their children with legal remedies, defective drug injuries and the right to claim compensation from drug companies, and both the reward and perils of EB-5 investment visa for Chinese investors. Her son, Sage Oliver-Zhang was also praised for his singing of Chinese children’s songs at the celebration.